Looking for quick and tasty party snacks? Look no further. 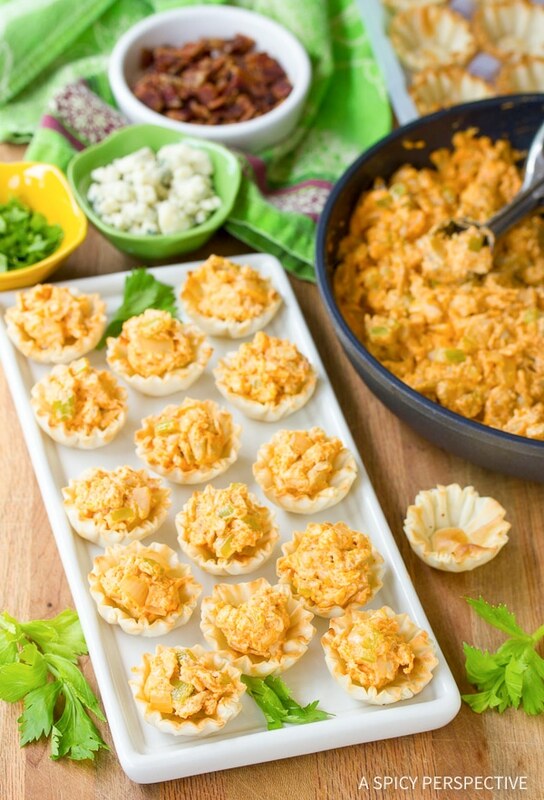 These itty bitty Easy Buffalo Chicken Bites are just the thing to serve at your holiday or game-day party! A hoard of feverish football fans are heading to your house this fall. Do you feel calm and collected? If not, that’s okay. Most people get a bit frazzled at the thought of preparing food for a large group. My game plan is to make a few show-stopping snacks, then fill in with easy store-bought items like chips and salsa, or veggies and dip. That way, the dishes I make really stand out, yet I’m not preparing days in advance. I always try to provide party snacks that are loaded with comforting flavors, yet are presented in a unique way. Like these little Easy Buffalo Chicken Bites. You can’t very well have a game day party without buffalo chicken, but you can steer clear of sticky wings and red fingerprints on the sofa. Easy Buffalo Chicken Bites wrap all the goodness of buffalo wings, in neat little packages to keep your fingers clean. I whipped up an easy creamy buffalo chicken filling with hot wing sauce, celery, onions, and cream cheese. Then scooped it into Athens Mini Fillo Shells. Before serving, I simply sprinkled crumbled blue cheese, bacon, and chopped celery leaves over the top. Voila! I love using phyllo cups for super bowl snacks like this. They are pre-baked, so you can serve them straight out of the package, but you can also pop them in the oven for bubbly-hot appetizers and desserts. 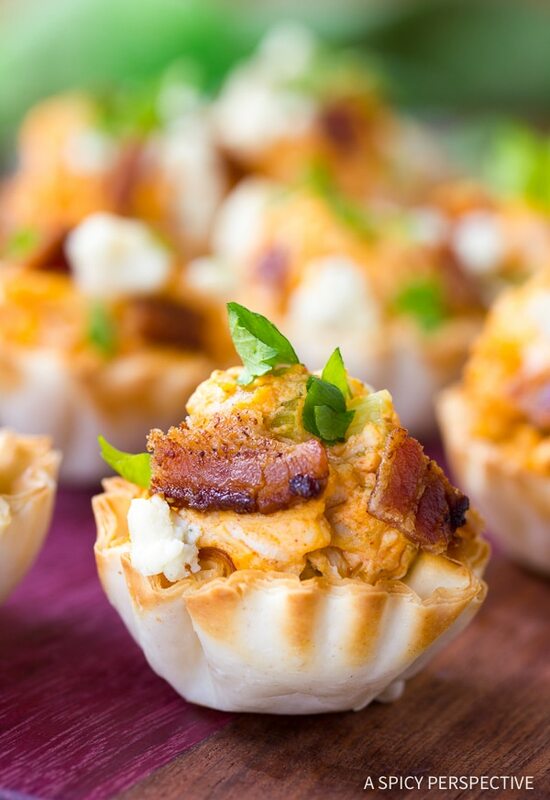 Easy Buffalo Chicken Bites are such and fun and tasty snack to whip up for all your fall events. 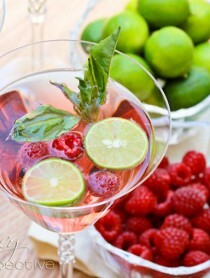 Make them for your holiday parties this year… They’ll be the first thing to disappear! Looking for quick and tasty party snacks? Look no further. 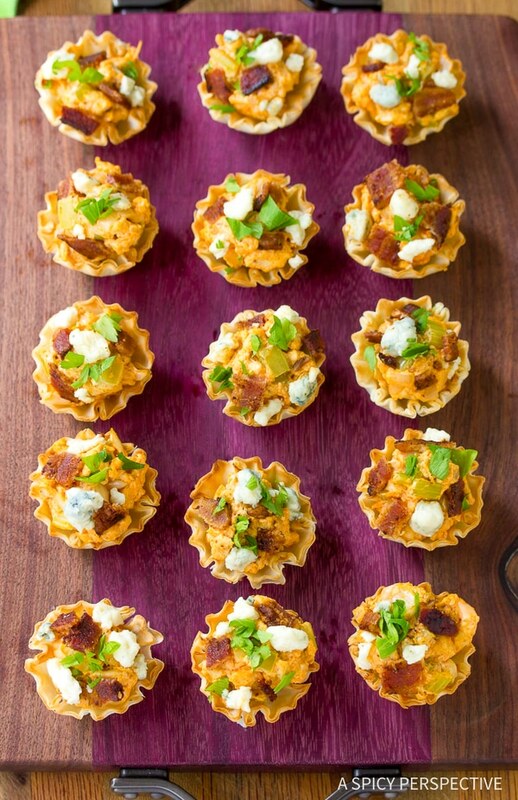 These itty bitty Easy Buffalo Chicken Bites are just the thing to serve at your game-day party! Heat a skillet to medium-high. Add the bacon and brown for 5-7 minutes. Remove the bacon and crumble when cool. Add the celery and onion to the bacon grease. Saute for 2-3 minutes to soften, then add the cream cheese. 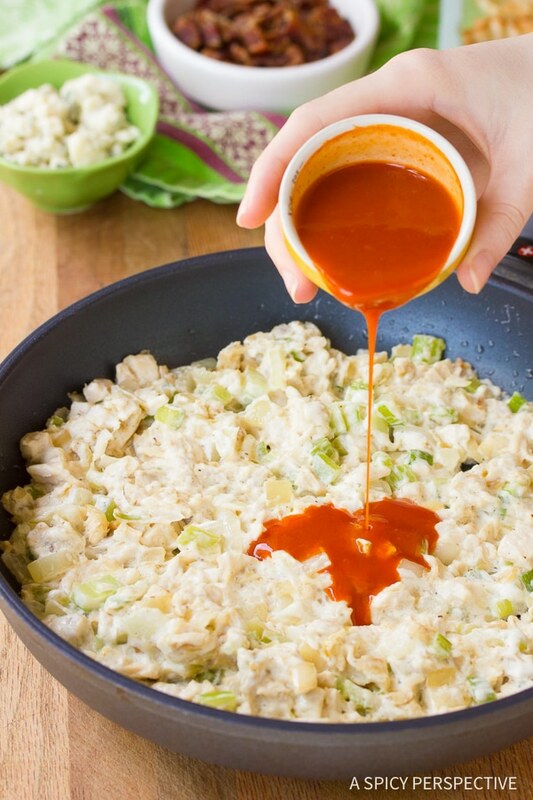 Allow the cream cheese to melt a little, then mix in the chicken and hot wing sauce. Mix well. 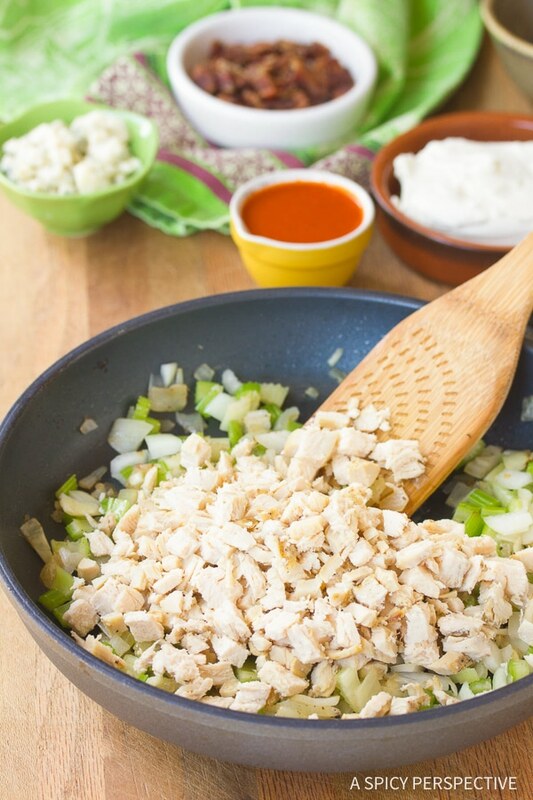 Spoon the warm chicken mixture into the phyllo shells. 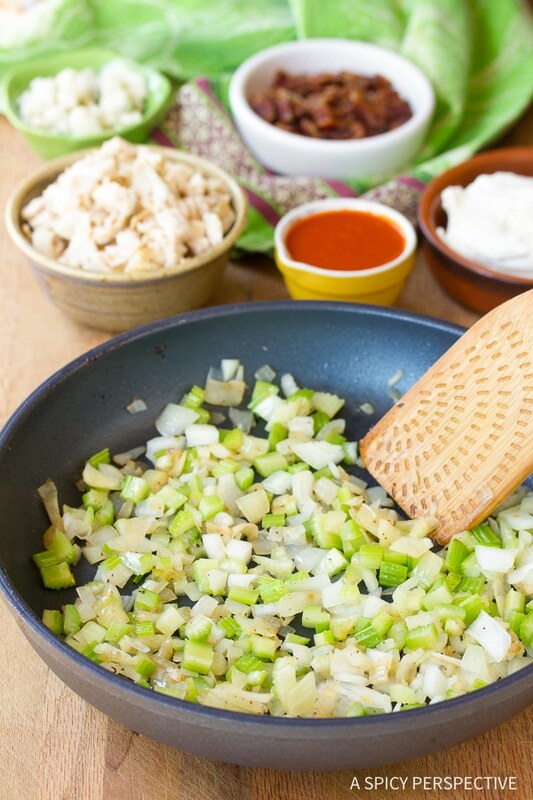 Then sprinkle the tops with crumbled blue cheese, bacon, and celery leaves. Serve warm or at room temperature. Can’t wait to try the recipe. These look so good Sommer! 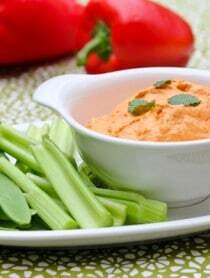 The perfect way to eat Buffalo Chicken! Love it so much – My family will happy for dinner today! Do bake the little phyllo cups? How far can these be made ahead and sever at room temp or reheat them? Those are so creative and fantastic Sommer!! Wanna try these! Look Delicious! These look so good Sommer! Can’t wait to try the recipe. Fantastic! We’ll be watching the Superbowl here in Australia, and as my Aussie husband loves a bit of Americana, this sounds like just the snack he would really love while watching the game. These little pastry cups are so so good! I can’t resist them with just about anything inside but I love buffalo, too so these look perfect! And just in time for Super Bowl. Great idea. I’ll take one if there’s any left! I’m making buffalo chicken pizza as we speak. Love these baby bites! I love the super bowl…mostly for the food! Yum! I’m not much of a football fan but I’d gladly make this any day of the week! These are so cute! Can’t wait to impress with these at my Superbowl party! These are adorable and they look so tasty! 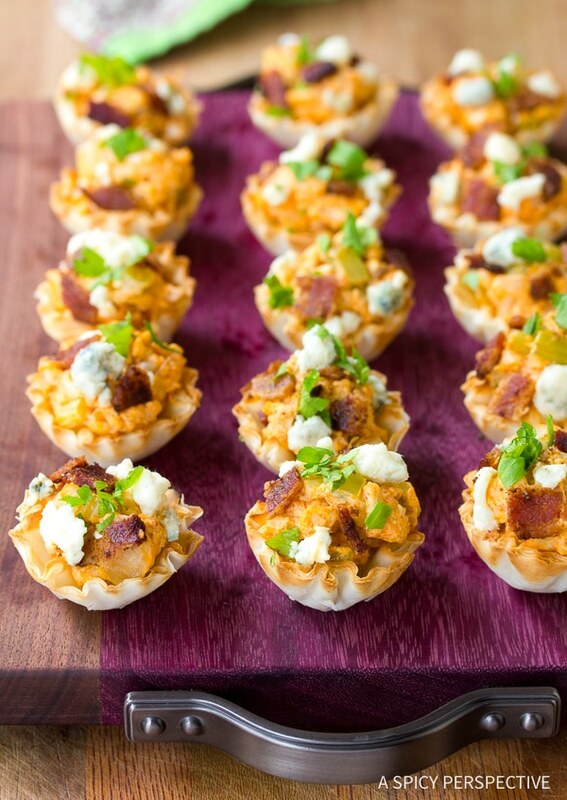 Just love those little phyllo cups and filled with buffalo chicken and bacon sounds wonderful! Love those little phyllo cups! These are a great alternative to the messy wing. Great flavor combination. I need to try these! These would be a bit hit with the boys for sure. I love those little phyllo cups they are just right for tasty bites! 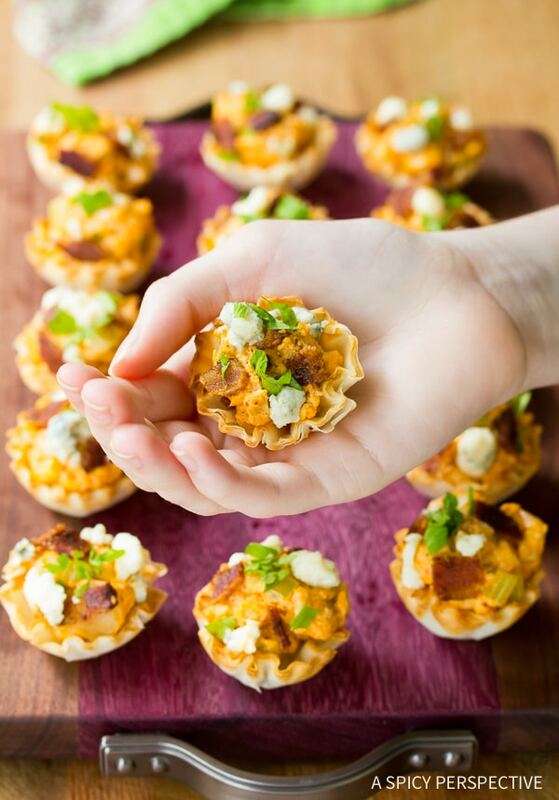 I love those little phyllo cups – I always keep some in my freezer because there are a million things you can do with them, and they are perfect for quick and easy last minute entertaining. These are absolutely delightful! What a flavorful creation. Although I’m not a fan of the Super Bowl, I’m still going to make these just to indulge a little! I’ll “pretend” to be watching the game while I eat these cuties! :P Have a good weekend! Bite size and perfect! I’d like the whole plate to myself :) Great party food. When I saw the title in my feed reader, I was expecting something totally different. After clicking through, I was pleasantly surprised :) These look SO good. Love the addition of celery leaves on top. These look so cute! I love finger food like this! This is seriously the perfect bite! 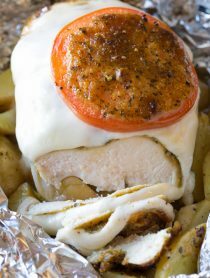 I’m going to have to try these (sans the bleu cheese) for our super bowl party. You know I adore these! Perfect for Super Bowl too! I love that these are bite size! I think food is so much better this way so you have an excuse to eat more, and try more! I’m mad for anything ‘buffalo chicken’. These are a perfect bit, so cute and I’m sure delicious. Great creation Sommer! Just included a link to you for a gluten free game day recipe round up! After our live chat this week I was left hungry for football food! You had me at Buffalo. These look incredible! A great addition to a Super Bowl party for sure! Those premade shells are a great time saver! And the flavor of buffalo chicken in one bite? THAT is a thing of beauty. Great photos too, Sommer! Fillo shells really are just so darn cute. Love these bites! LOVE these mini fillo shells — so cute! I couldn’t stop at just one! I love a good bite size snack. Anything with buffalo sauce is a major win for me! These look amazing, Sommer! Thanks for the idea! I love those Athens cups, they make everything so much faster and love the filling! I don’t even need a a game to want to make these – they are too stinking cute! How freaking cute are these!!! Love mini bite sized things! I’m kind of dying right now. Delish!! I love small bites and yours really pack a punch of flavor. all the men I know will love these! Women too! I’ll take a dozen, please! I wouldn’t need any other game day food but these, YUM! Have a great weekend, Sommer, and thanks for the link! Thee would be great for a super bowl party! Such great snacks! Love these! 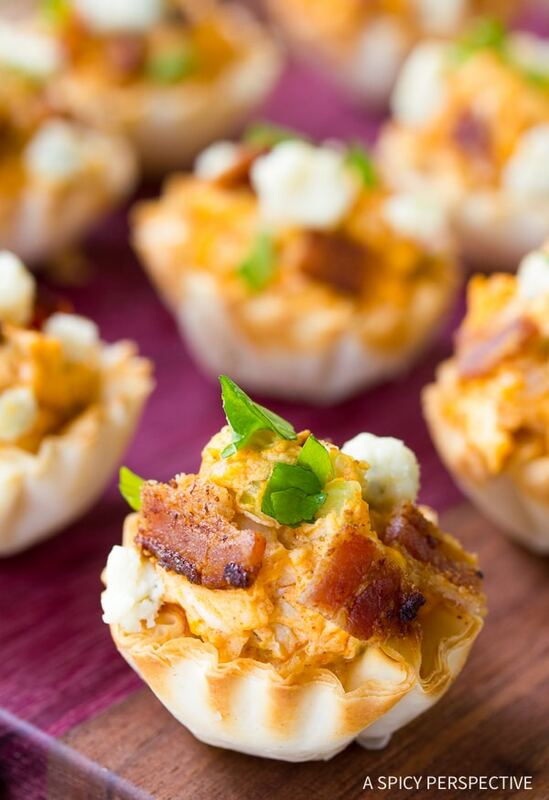 I love the idea of little buffalo chicken bites in a crisp shell! Super Bowl is all about the snacks so these would be perfect. I can only imagine how quickly these babies will go at a super bowl party. They look divine! I love these!! The perfect way to eat Buffalo Chicken! I love bite sized snacks. These are awesome Sommer! Fantastic! Almost too elegant for the way I’d just pop ’em in!